This Summer, the fur will fly, the moose will drive and the world will discover this is not the same old bull. 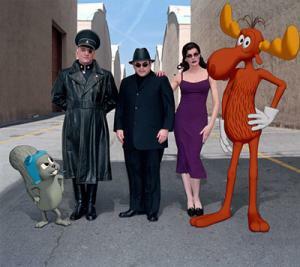 Robert De Niro, Jason Alexander and Rene russo in The Adventures of Rocky and Bullwinkle. I just watched this movie and I honestly could not explain the plot (what little there is) to you even if I had to. Just understand that the cartoon characters come to reality and their villain counter parts become real people. The bad guy leader, Fearless Leader, spends his time trying to conquer America with bad television shows. While his two cronies Boris and Natasha attempt to bash, crush, shoot, squish and stop the Moose and Squirrel. The filmmakers here keep the pace going very quickly and throw in several cameo stars. They use creative names like General Admittance and Karen Sympathy. There is lots of 'Hollywood' talk. Using words like hiatus, rerun and running with a too long joke about green lighting a project. Some creative ideas were put into this, but nothing can save this convoluted mess. The actress who plays Karen Sympathy is one of the worst actresses I have had to watch. Her performance was completely insincere. I kept thinking how good she made those Olsen twins look as actresses. The only part of this film I liked was Bullwinkle and Rockies conversations. Their banter was often hilarious. 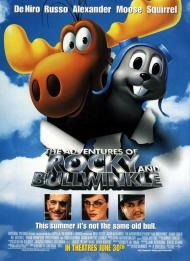 Bullwinkle walks through this film not fully aware of anything and thus I felt I could relate to him. 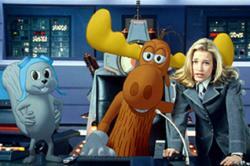 Rocky, Bullwinkle and Piper Perabo in The Adventures of Rocky and Bullwinkle. This movie is a joke on itself. In the beginning, a movie executive examining scripts and rejecting them, jumps at the chance to make a film based on the old Rocky and Bullwinkle cartoon. Her idea to produce the movie is vetoed. The joke is that the real producers didn't do the same. Since the stars of the movie are supposed to be Rocky and Bullwinkle, you would think they would have more screen time. Especially, as Eric points out, their times together are the best scenes in the film. Instead, too much time is spent on Boris, Natasha, and their pathetic attempts to kill 'moose and squirrel'. I also agree with Eric in his assessment of Piper Perabo's performance as Karen Sympathy. Although she isn't given much of a script to work with, she manages to make a bad thing, even worse. She looks more like she should be playing a high schooler, then a FBI agent. Part of what makes this movie so bad is that the original Rocky & Bullwinkle show was supposed to be a children's show, but most of the jokes were really aimed at adults. This movie dumbs down the humor to the point of a Road Runner cartoon. As for Robert DeNiro, I hope he was paid a vast amount of money to whore himself for this movie. I can think of no other reason an actor of his caliber would appear in this trash. Rene Russo, Jason Alexander and Robert De Niro in The Adventures of Rocky and Bullwinkle. This is certainly not a great movie. Still I managed to enjoy it more than either Eric or Scott. After all this is a movie based on a children's cartoon series and as such is properly silly and ludicrous. I do agree with my brothers that more screen time should have been devoted to the title characters instead of the disappointing villains. Interestingly enough the best part of the movie is early on, before Rocky and Bullwinkle join the real world. It is during the first twenty minutes or so that the spirit of the original show is the most closely duplicated. There are several witty lines such as when the narrator says, 'Even their word play has become hackneyed and cheap.' To which Bullwinkle replies 'It was always like that.' Unfortunately, the movie quickly goes downhill from there. One other aspect of the movie, which I enjoyed, were cameos by famous comic actors. Janeane Garofalo, Jonathan Winters, John Goodman, Billy Crystal and Keenan and Kel, Of Nickelodeon fame, all make appearances. Like Scott, I think Robert DeNiro makes a fool of himself as Fearless Leader. Even spoofing his trademark line from Taxi Driver, 'are you talking to me' in a ridiculous accent. All in all, this movie tries very hard to be fun, and for children at least, it manages to succeed. For anyone over the age of eight, see Chicken Run instead.